I still have no actual sewing to show, but before 12th Night comes around and Christmas is officially over I wanted to get up a quick post about my #sewingsanta gift. Organised by Lisa of Stitched Up from the Start, I am sure you can guess the drill; express an interest, be given a name and a blog link, spend no more than a tenner, send off a gift and eagerly await your parcel in the post. Thanks, Lisa for arranging it all! (excuse the blurriness – it was Christmas morning; excitement was high, bucks-fizz had been consumed). Thank you Sparkle Needles – I love it all! Anyway – Happy New Year everybody; may 2015 bring you much happiness. I have thought a lot about whether to post about this. 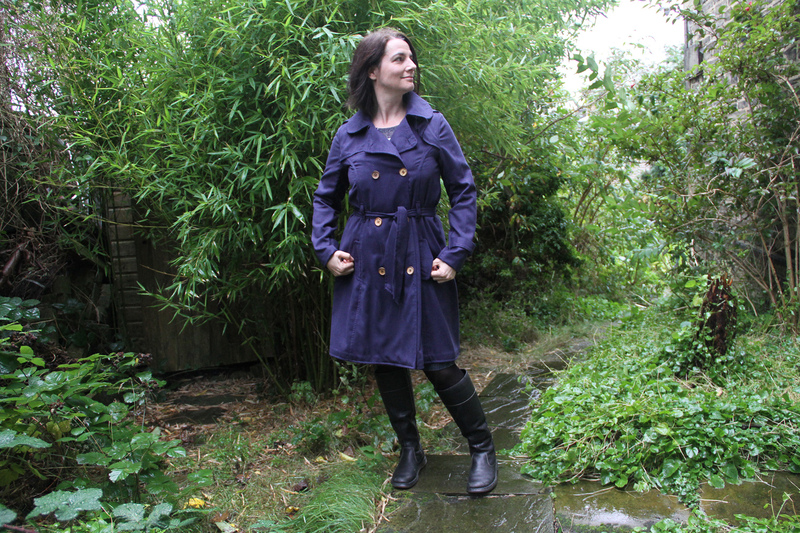 I have decided that although my blog is “mostly about sewing”, that means it is not all about sewing, so I can share whatever I want here – and I just kind of want to get this down in writing. 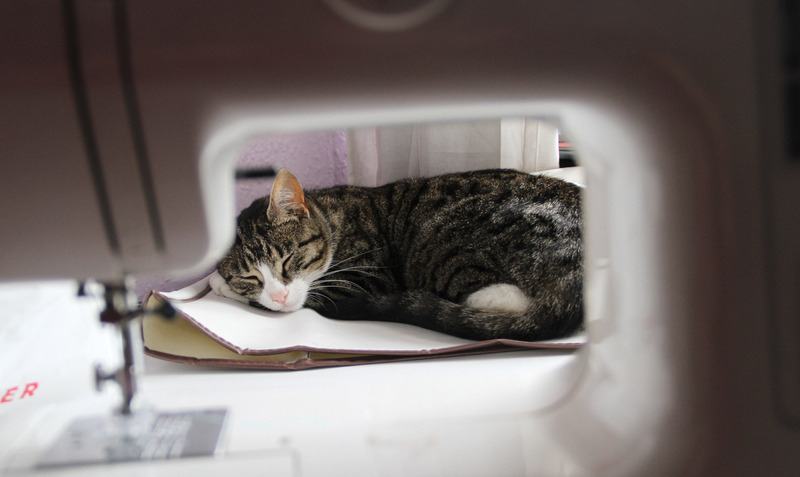 So, if you’re not interested in posts which are nothing to do with sewing just skip this one. 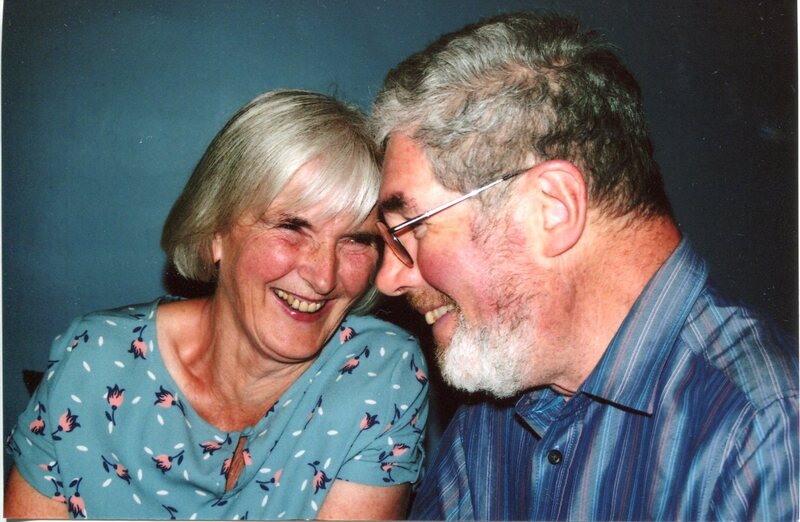 In January this year my mum, Rosemary was diagnosed with oesophageal cancer. In July she died. For the first three months we thought that there was something could be done; the first suggestion was chemo followed by an operation, then they decided to skip the chemo, then they realised – on the operating table – that the tumour was too large, too embedded and they could not remove it. By now she was too weak from the surgery to undergo chemo. If she could get stronger there might be a chance, but she was unable to eat enough to even maintain her weight, let alone regain her strength. I am lucky in that I live an hour’s drive from my parents’ home, and my partner and I have our own business, so I was able to take a lot of time off for hospital and home visits and to just spend as much time as I could with Mum. My brothers are not so lucky; they both have “proper” jobs and live further away (one of them in Canada), so could not just drop by or visit for a day or two. But though I would not have wanted it any other way, I’ve got to tell you it was exhausting. I was spending most of the time at my parents, popping home occasionally to catch up with JB and Tash and I would realise on the drive back that I was just worn thin. It wasn’t that I was doing much; a bit of cleaning or gardening, maybe, but most of the time was just spent trying to engage Mum in anything. In some ways, that was the hardest thing; she stopped living long before she died. And I am not saying “she just gave up, she should have fought it”; she just had no energy and no hope (not helped by the fact she had also seen her brother die of the same type of cancer 4 years ago) and her world shrunk to the size of their living room. It is not that I wanted her to be putting on a brave face and constantly cheery (no more did she want that of me), but it did seem important that she had some small joys in whatever time she had left. So dad and I would nag and cajole and persuade her to do the crossword, or sit in the garden and supervise my inexpert weeding, or just get in the car and go for a drive. We did a small thing each day, which made us all feel (a little) better. 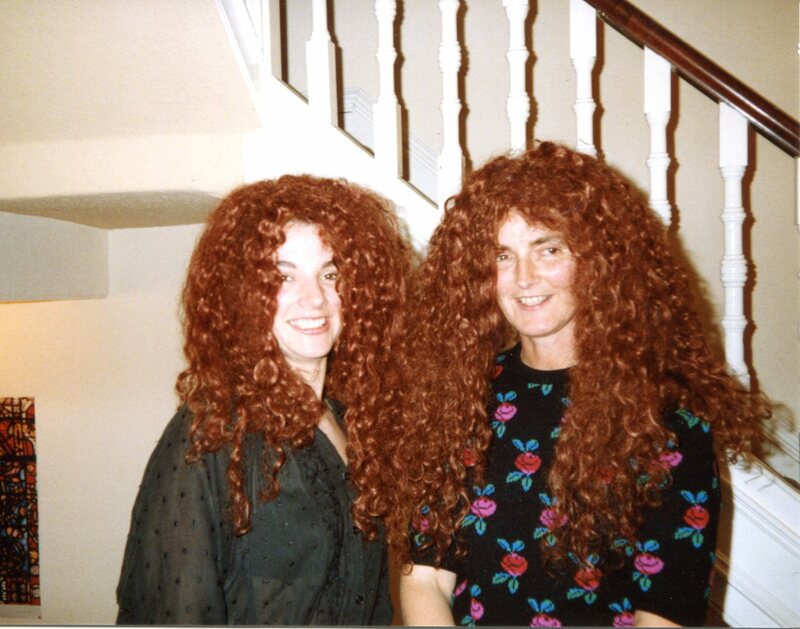 My brothers and I wrote the eulogy together for Mum’s funeral, through which we laughed and cried for days, making inappropriate jokes of which she would have strongly approved. 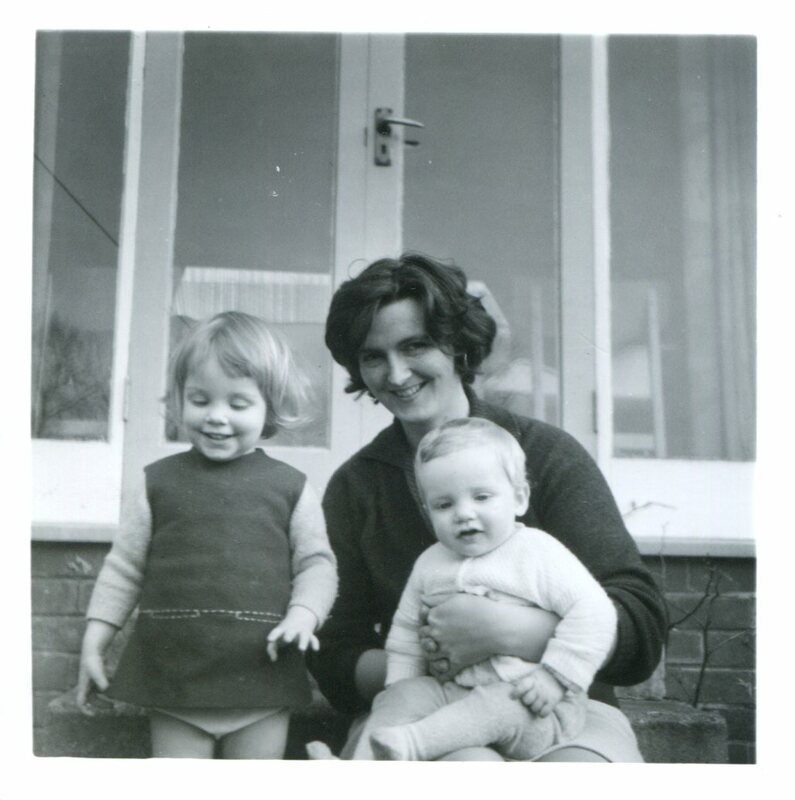 What made Mum special and unique and frankly one of the best people I have ever known was not found in her deeds or her CV and was difficult to capture in words. She was a teacher before we were all born, then she stayed home with us, then she worked in a toyshop. She did not write or paint or sculpt (though she was very good at the first two), she did not volunteer with the homeless, start her own theatre company or trek the Amazon basin. She was beautiful and unassuming and had the best sense of humour, though she was not one of life’s comics. She could be the quietest person in a room, yet her presence was felt by everybody. Her life could not be told in achievements, but she was active and generous and funny and she had a gift for making people feel better. Although it was a long six months of watching her gradually fade, I am glad to say that she was not in pain for most of it. She had some discomfort and she was tired and out of sorts, and I cannot imagine how she can have felt knowing that she was dying, but the awful, awful end was mercifully short; She went up to bed OK on Tuesday, but was unable to get up on Wednesday morning. 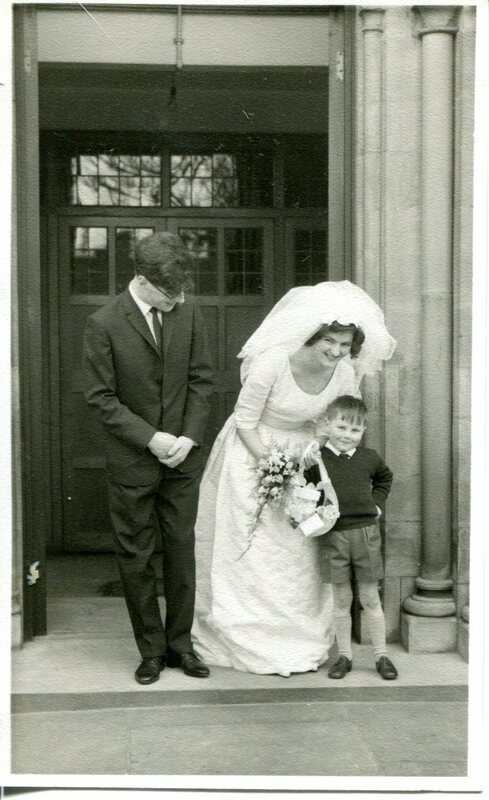 Happily both of my brothers were on the way (though dad and I had told them there was no hurry the night before! ), so the whole family was together by Wednesday afternoon. Mum was on pain medication and was beginning to drift in and out of consciousness, but she knew we were all there and we all sat in the bedroom with her, telling stories and reminiscing together. On Thursday the lucid moments were few and brief. She was very distressed a lot of the time. It was a harrowing and surreal day for us all. At 12.15 on Friday morning she died. I know that it is not unusual to lose a parent at this age. I’ve been on this earth for 45 years now and for much of that time I have known that one day I would have to deal with the death of my parents. I don’t think there is anyway you can ever really prepare for it, though. But I am grateful for so much. Grateful that I had a full 45 years of knowing her – many are not so lucky. Grateful that we all had the time and the opportunity to say goodbye. Grateful that she did not have to live with the knowledge of her own end for years and that she was not in pain for long. Grateful for my family and how close it has brought us all, and grateful for my friends and their unending support. 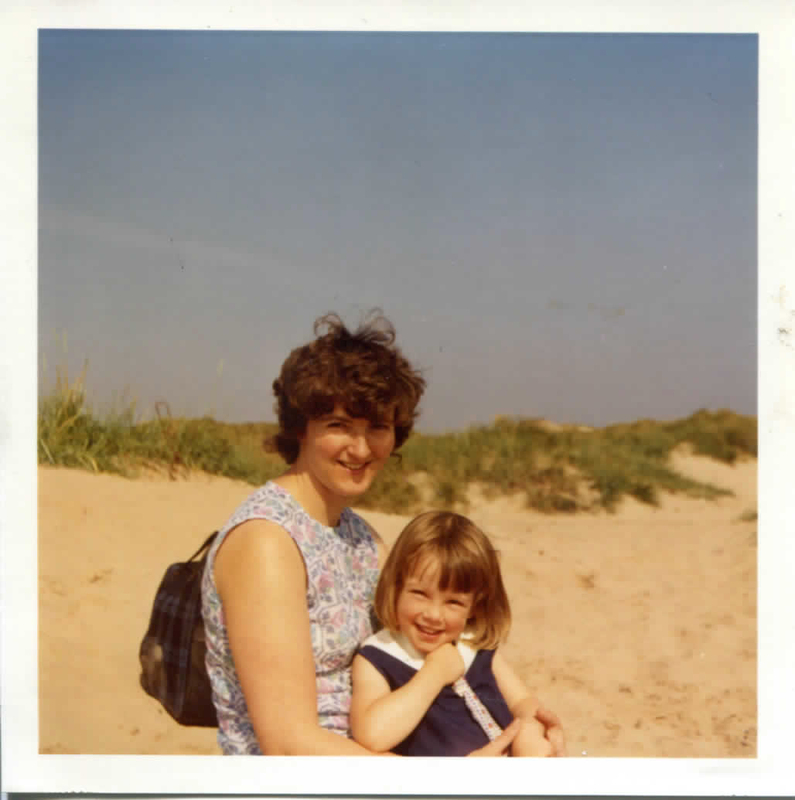 But most of all I am just grateful that she was my mum and for all she taught me about being a human being. 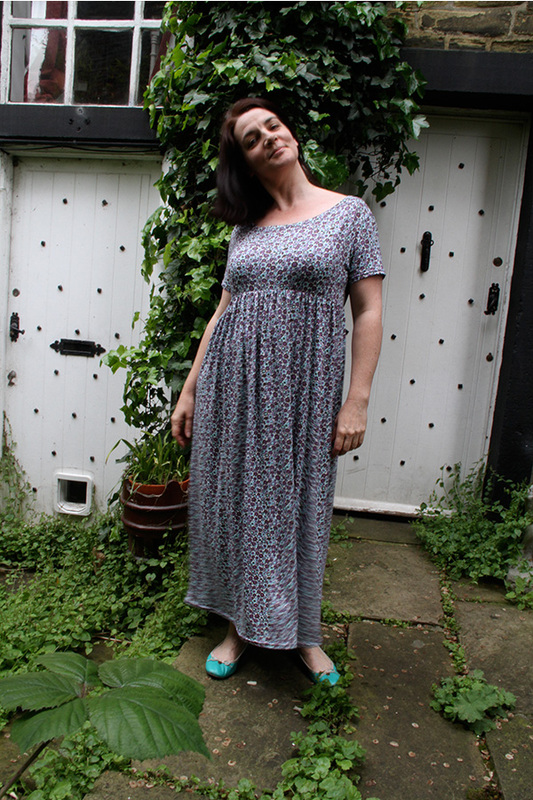 The lovely Amanda from Sew Deputy got in touch with me the other day and asked if I would want to be nominated for the old Blog Hop which has been doing the rounds of the Sewing blogs for the last few weeks. I am sorry to say that I am not actively working on anything at the moment. Unless you count UFOs in which case there is a cotton print Anna dress (tried to make alterations on the fly and it has gone a bit funny around the waist seam), a green Gabriola skirt (really a muslin, in unsuitable fabric – just not feeling it), a grey Elizalex (put on a bit of tummy weight since I started), a cream something or other from the Colette book (started so long ago I can’t remember the pattern name). I think calling it a process is a bit grand, really. I just sit and write. Sometimes it spews out of me in a reasonably coherent manner. Sometimes it doesn’t. Sometimes I have to keep deleting and starting again. Sometimes I don’t. 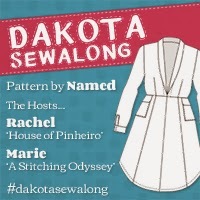 I don’t feel that I am qualified to be giving anybody sewing advice or posting tutorials, so I don’t have to worry about getting any technical details right. And as I am not offering up any great sewing insights I am really just here to have a bit of a chat with you. So I sit and I type – editing a bit as I go. And then I will always read it through when I have finished, at which point I will usually make some tweaks, if things are not as clear (or grammatically sound) as they could be. (Then I will usually spot a typo when I hit publish). The reason I do the whole blogging thing is something I have sort of addressed before, but I don’t know if that post really covered it properly (and I can’t be bothered to go back and read it myself, so let me know if I say anything good). I am certainly not in the I write because I must… camp – I think if that were the case I would probably have managed that novel we apparently all have in us by now. As I mentioned above it is also not because I feel I have great stitchin’ skills I must share with you all. It is mainly about the engagement with other sewers. And it gives me somewhere I can show friends and family what I have been making (without having to actually, like, wear it in public…). And I do really enjoy writing – and there is a little narcissist in me that enjoys the fact that literally tens of people will read what I have writ. Anyway – some of the blog hop posts I have seen have had more questions, but Amanda only had the two, so I feel I can call it a day there. And, I kind of managed to sneak in an answer to the “why do you do what you do” question without even being asked it! I’m going to go with Lady Sewalot, as Lauren is really cute and her enthusiasm is a tonic to a jaded old witch like myself, and Clarinda Kaleidoscope, which is a fairly new blog I only found this morning (via Handmade Jane’s OWOP winners), but which I really enjoyed reading. 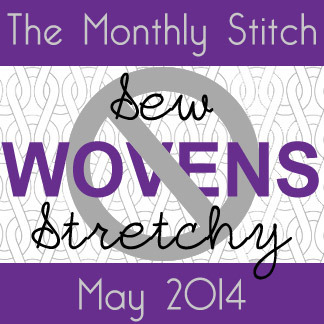 June is Independent Pattern Month over at the Monthly Stitch, with each week bringing a new challenge. For the 1st – 7th June the theme is dresses. Anyway, enough of what I didn’t make… After that I really needed a quick win and for that I wanted an easy make with minimal fitting. Enter the Staple Dress from April Rhodes. This pattern had been on my radar for a while, but I had always thought it looked a bit simple for the $15 price tag. 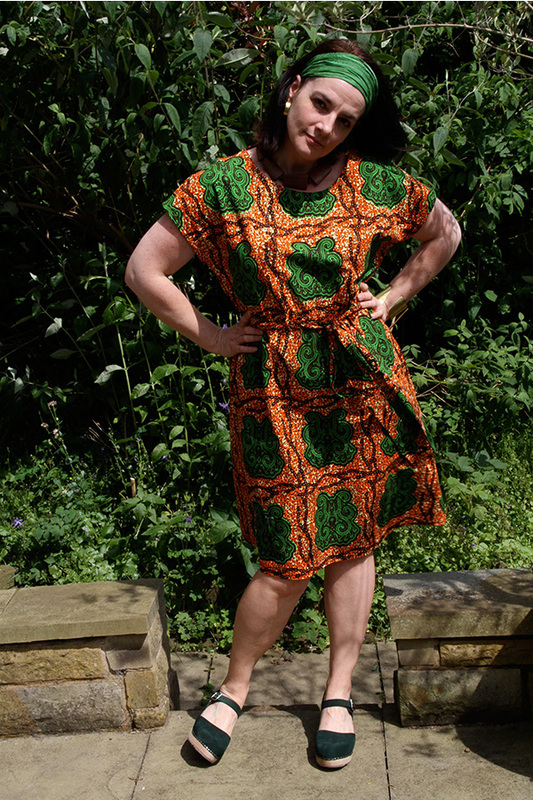 I mean it is a really lovely dress – I have seen many lovely versions, but it is basically a front and a back stitched together with a shirred waist, so though I had often looked at it there was always a voice in my head telling me I could probably more or less work it out on my own. However, when it was included in the new Perfect Pattern Parcel, I snapped it up and now I’m glad that I have this lovely pattern to work from. I made it in a size XL. I think the L is closer to my current size, but with that low body confidence and all I wanted it super loose. 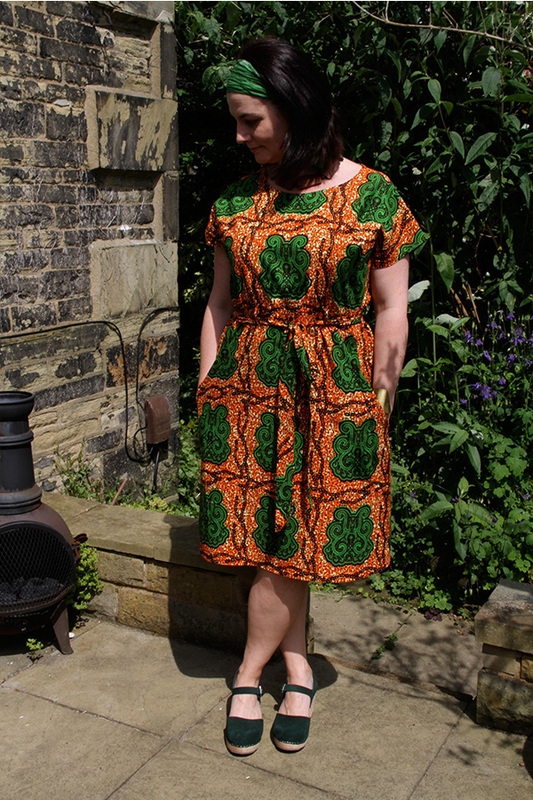 I used an African Wax Cotton print I bought on eBay – it was a 6 yard piece and I probably used about half of it in order to get my patterns matched (plus I wasted an inordinate amount making the belt). The instructions are really clearly written and fully illustrated, so this is an ideal pattern for a beginner, or a quick and satisfying make if you have a bit more experience and a few hours to spare. 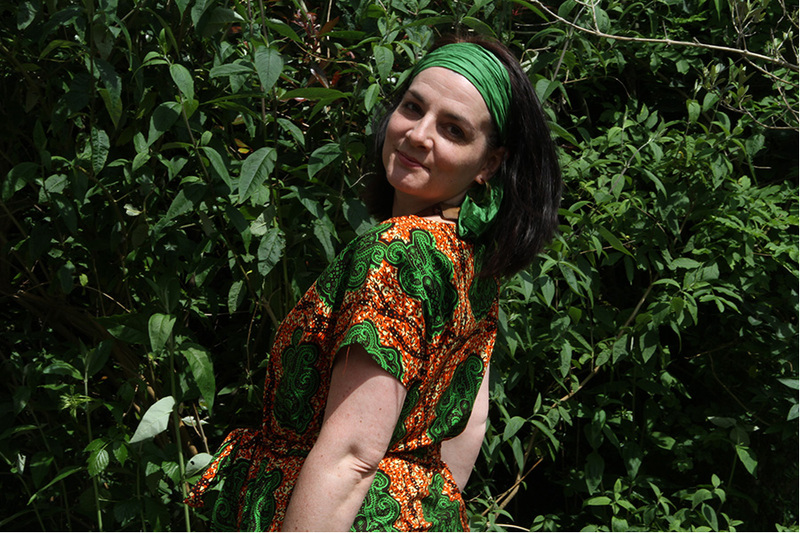 The pattern calls for bias strips of the self fabric to bind the neck and armholes, but I decided that this print worked better just left plain, so I used a contrast ready made bias to turn under and then topstitch. 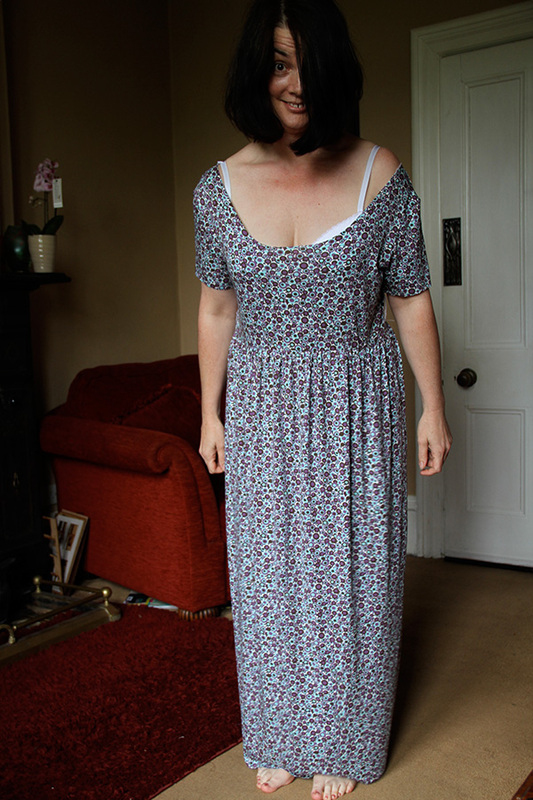 I don’t mind shirring in the traditional way, but I have never tried it on my current machine and after following SewBusyLizzy’s trials on Twitter I decided to just dig this out of my stash as it is really easy to use and gives a good wide elasticated finish. If you’ve not come across it, it is a kind of elasticated mesh tape, which you just stitch to the wrong side of your fabric (holding it taut as you sew), and you don’t need to play with the tension of elastic on your bobbin! The only other alterations I made to the pattern were the addition of belt loops and a self fabric belt, which I made super long so that it can tie in a big bow (front or back) or it can wrap around three times. Total cost: About £14.00, but I intend using the pattern again. Time to make; including pattern printing, taping etc, with addition of belt loops and belt, 4-5 hours (I think). Will I make it again? Almost certainly. Conclusion. I really like this dress. It is a very easy make, but I love the casual shape and it is perfect for summer days and pizza bellies. And what would a sunny photo shoot be without a cat photobombing me? And finally, how do you like my shoes? They are Lotta From Stockholm clogs and were a birthday present from JB – he has such excellent taste (with only a bit of guidance). 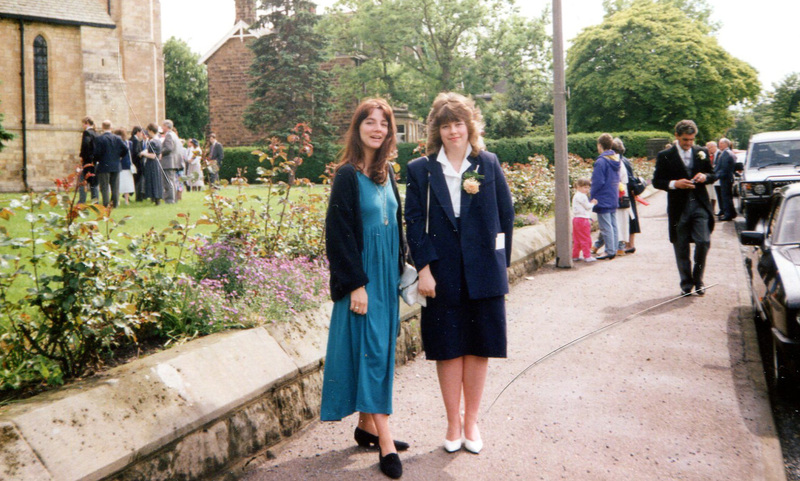 When I was in my early twenties (so over half my lifetime ago!) I had this dress I loved. It was loose and long, with a high waist and low hem, turquoise jersey with buttons down the back. It should’ve looked like a sack, but somehow it was every kind of flattering. Easy to wear, to dress up or down. I wore that dress until it fell apart. I’ve often thought about recreating it. So for my third Sew Stretchy make I decided it was time to give it a go. As I had acquired the lady skater pattern as part of the first perfect pattern parcel, I used the bodice as a starting point, but from there on it was a pattern hack with emphasis on the hack. I added abouth 4 inches to the width of the bodice, scooped out the neckline a bit, chopped a few inches off the bodice length and then made a skirt from gathered rectangles. I’d serged that thing together, so those seams were solid. 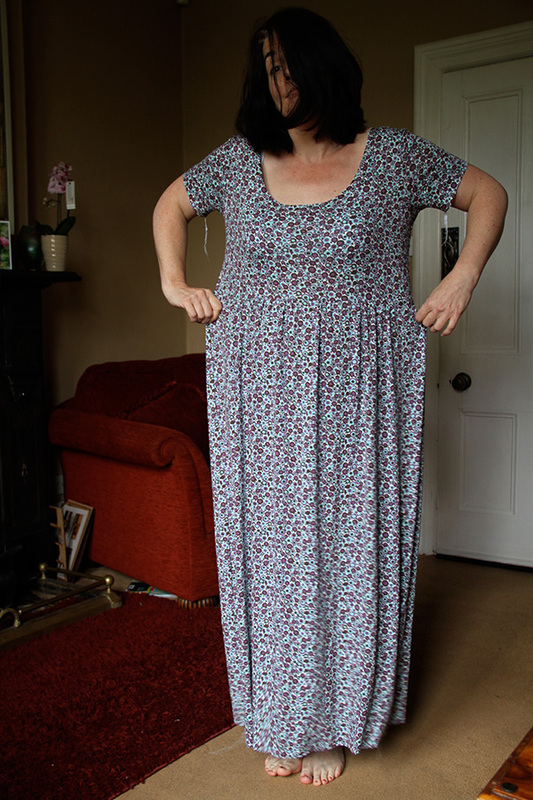 And as I had done waist seams before side seams I could not just unpick the waist and take it up a couple more inches. Anyway that would still leave the indecent neckline. I considered pulling it up at the shoulders, adding a pleat and calling it a feature, but it just looked a bit too Laura Ashley circa 1987. So I sat down with my seam ripper, the Wicked Stepdaughter and some girl telly and I unpicked. Every seam except the shoulders and sleeves. Which took about two and a half hours. I then hacked randomly, which took about two and a half minutes and sewed it back together, which didn’t take long at all. What of the low neck? I hear you cry. I just flipped it (like a burger) and added a scoop back to the design. I used clear elastic at the shoulder and waist seams. At the shoulders it is purely for stabilising, but at the waist I used it to gather the fabric, too. And can we just talk about the fabric a minute? I got it in the great 99p per metre birthday fabric haul of 2012. I didn’t like it that much on the roll, but I was finding inexpensive “practice” jersey difficult to come by, so I added some to my pile. Now it is made up I really like it! Somehow less of the white background shows than when it is flat and I think it has a bit of a Liberty feel to it. The astute among you will have spotted that this dress does not have a button back. I might give one a go one day, but for the time being I felt that buttonholes and packets in thin knit fabric with no instructions was just asking for trouble. So the dress is not perfect; all the chopping and not much measuring has left some of my seams a bit wonky, and I went a bit off grain with the skirt, but overall I really like it and am going to make another in a solid colour. Final construction notes for those who are interested. I cut the neckband 10% shorter than the neckline, but with a fabric this floppy I think I should have cut it about 12.5% shorter instead. I used a twin needle on all hems and to finish the neckline. So, I’m glad that Sew Stretchy month has pushed me into sewing with knits. I’ve had all of my last three makes on my list since, like, forever and am now a total knit convert. 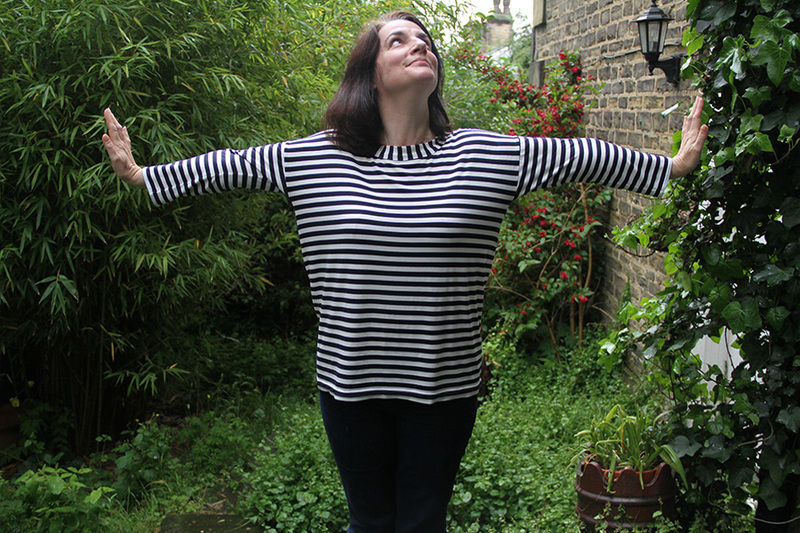 As my Hemlock tee was such a simple make, I thought I would try my hand at a second knit top this month. I’ve had a couple of the Drape Drape books for a while now, so I decided to give the popular pattern no 4 from Drape Drape 2 a go. There are so many great versions of this top out there and mine was also successful… up to a point. The thing is, I am not built to Japanese pattern proportions and I knew that even the largest size be pushing it. However, the shape of the pattern was so different to anything I was familiar with that I did not feel confident about trying to grade it up. I will spare you all pictures of it on me, as it definitely looks much better on my dressform than stretched over my wobbly bits like a silver-grey sausage skin. I do love this top. I just don’t love this version of this top on my body. It did turn out to be another really quick and easy make, and now that I have seen how it all goes together I don’t think that grading would be at all difficult. For some reason, though, looking at the flat pattern piece beforehand I just could not quite see how it was all going to work. It seems I only get around to making /posting makes for the Monthly Stitch at the moment – and this month the challenge was to sew with knits. I started by making a super slouchy version of the (free!) 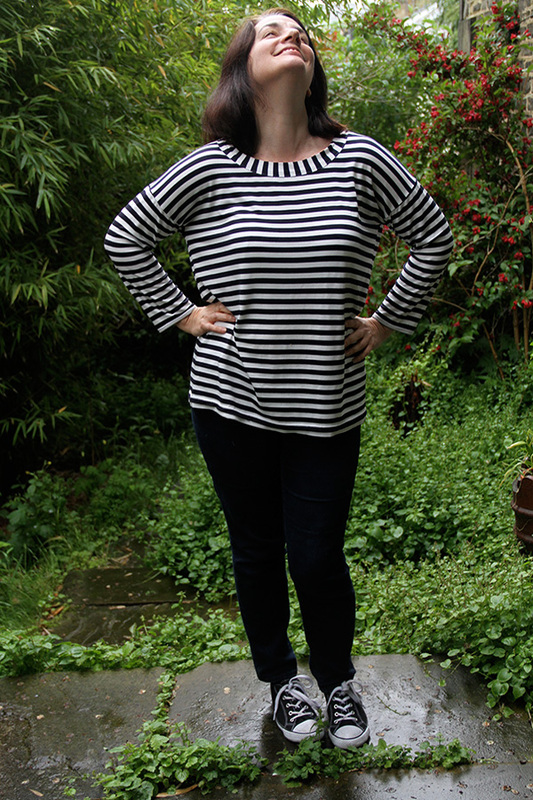 Hemlock Tee by Grainline patterns. 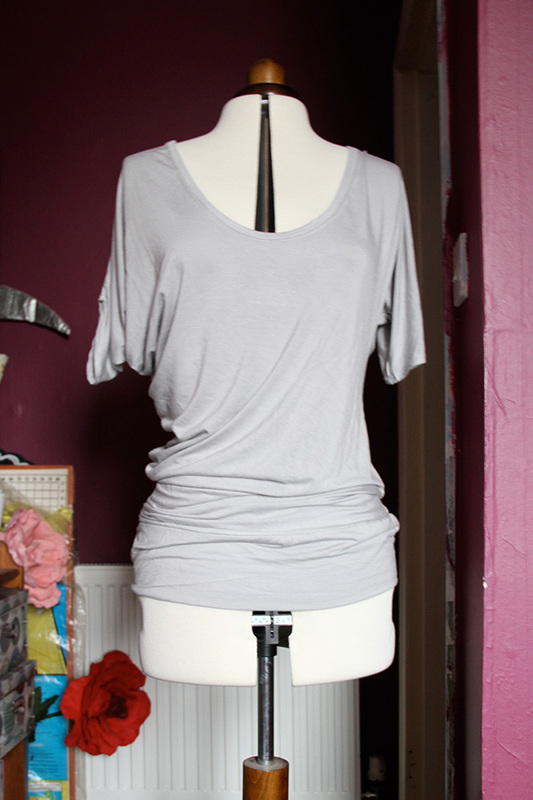 The pattern is designed to be a slouchy, loose fit tee anyway, but it only comes in one size and as I wanted to ensure a good amount of wearing ease I added 4cm to both the front and back pieces and 3cm to the length. This really is a super simple make. 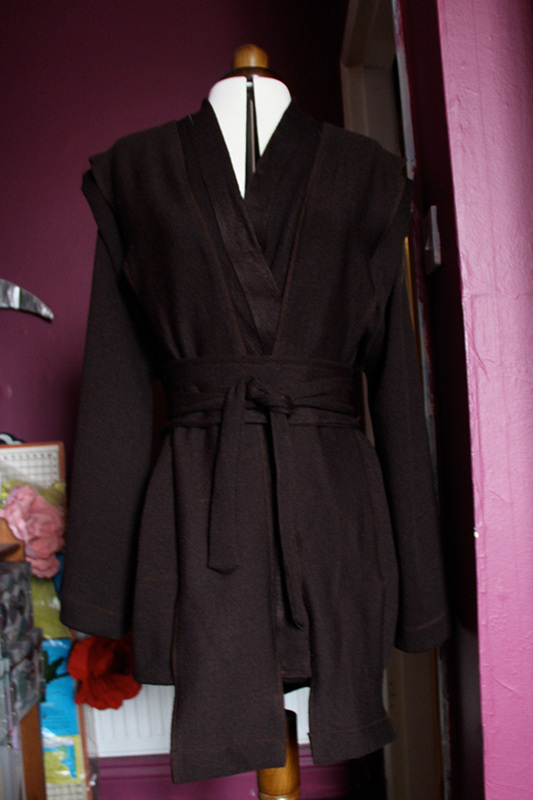 I serged all the seams and hemmed bottom and cuffs with a twin needle and it probably took me about 3 hours in total. 1 hour of which was printing, sticking together and tracing the PDF and one hour working out why my serger was not working. The fabric is a thin, super stretchy, super drapey jersey that I think I bought off that ebay. 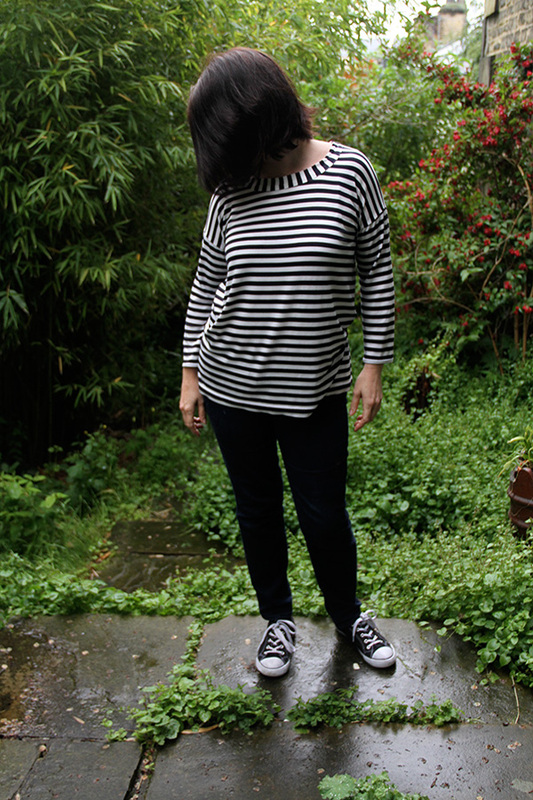 It was left over from the breton top I made last year. Although collar bands should generally be cut on the crosswise grain I had to cut this on the lengthwise grain, as I had used up pretty much all of my fabric and this was the only long enough bit I had left. The fabric has enough lengthwise stretch for that not to matter but I would have preferred not to have that vertical (ish) stripe framing my face. 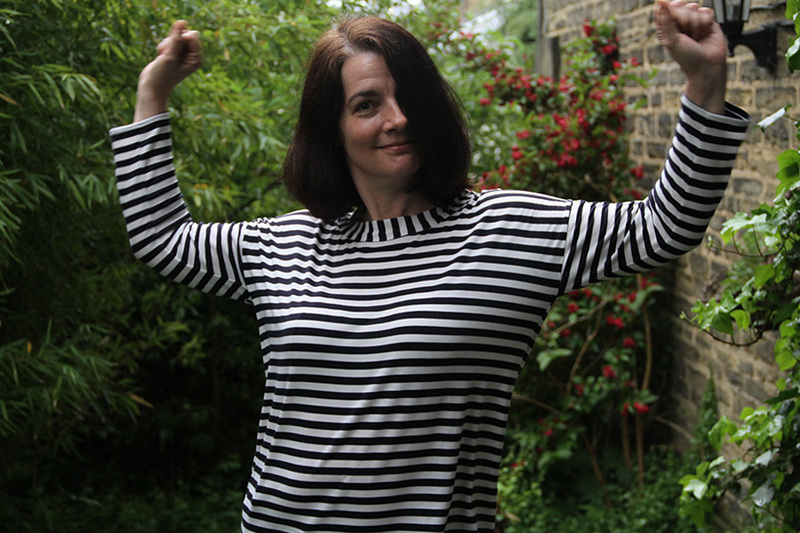 I am the stripe matching Champion! 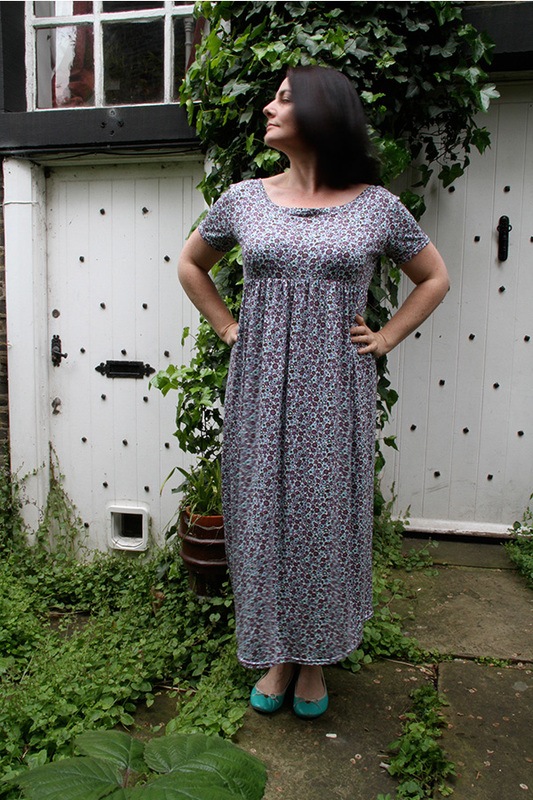 So, now I have the pattern cut out AND a functional overlocker I should be able to knock these out in about an hour – and I probably will as you know it’s going to get more wear than any of the pretty frocks I make! Bad Hair Day, Bad Face Day, Bad Weather Day… I really must put aside some time for better blog photos! As this is such an easy make I have attempted a couple more knit fabric projects this month, but in the interest of (semi) brevity I will save them for another day. Ooh – while you’re still here, though, do you remember I said that the Wicked Stepdaughter wanted an Obi Wan costume for the last day of school? Turns out it was more a “general Jedi” top she needed, as Obi (that’s Mr Kenobi to you) wears cream and it had to go with her black jeans (honestly – that girl loves a bit of cosplay, but she does like to keep her skinnies as a base). Creations in fabric while the dachshund dreams.